Born in 1988, Marie-Theres Stickler grew up in the snowy mountains of Lower Austria, a region often called the cradle of the alpine yodel. Later on, yodeling became a focal point of Marie’s life. She started teaching herself the diatonic button accordion from the age of 6. Both her music-loving mother, Helen, and the famous Hubert von Goisern, who stormed the charts with “Hiatmadl”, guided young Marie’s interest in the instrument. In subsequent years, she has taken part in many harmonica events, meeting her first teachers in taverns. A number of seminars and ensembles followed. She also participated in many music competitions with success. At the age of 13, she started learning with Hans Schröpfer, while playing with various bands along the way. In 2006, she began studying a Bachelor of Teaching in Folk-music Instruments, specializing in diatonic harmonica, at the Mozarteum in Salzburg. Shortly after beginning her studies, she joined the ensemble die Tanzgeiger in Vienna. The challenge of bringing various musical landscapes and styles together harmoniously– in this case, from West- and East-ern Austria, from Salzburg to Vienna – proved an enriching experience. Juggling gigs, concerts, workshops, seminars and tours, Marie-Therese has been tirelessly playing ever since. In the young Viennese folk music scene, she has found some like-minded performers, namely the large circle of musicians answering to the name Aasgeiger, who play in different formations and help the lively Stammtisch culture flourish. 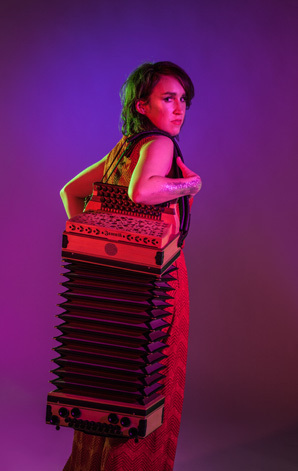 For a few years, Marie has been fiddling with all sorts of folding devices: diatonic accordions – like the Styrian accordion – but also chromatic ones – like the Viennese strumaccordion – or even with a mix of both, such as the Chemnitzer Konzertina, ancestor of the bandoneon. As the result, she can play diatonic, chromatic, Styrian and Viennese styles, with an emphasis on style. Aside from her role in ALMA, where both traditional and contemporary music blend in a unique way, Marie-Theres also plays lively traditional music with the Tanzgeiger, new Viennese world-music with a jazzy touch with Martin Spengler und die foischn Wiener, and participates in numerous exciting projects that come her way and make life all the more interesting.